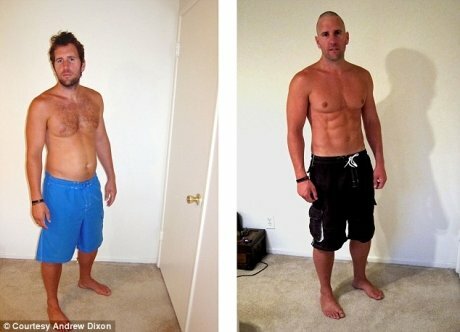 The photos below show how easy it is to fake so-called rapid weight loss, promoted heavily by nutritionists or fitness instructors that do nothing than to mislead people. The man in the photos, professional personal trainer named Andrew Dixon, shows step by step how you can get such a transformation in just one hour! Andrew mentions that in the first image weighs 83 kg and body fat percentage stands at 16%. Immediately he has shaved his beard, chest and head hair and wearing other pants, black with a waist that makes him look skinny. He later did some crunches and pull-ups in order to strain muscles. When did the picture he adjusted the light so that the body shadows to advantage his physic, he strained under belly and tighten the abdomen. The result you can see below, and the difference is amazing. “In my opinion, those pictures that promotes rapid weight loss diets and programs are fakes, and we just proved this. Through those images not only robbing seeks potential clients. Don’t believe everything you see! If you really want to have results have to work hard, to be determined and go to the gym for a longer period. To get an enviable body in a few days is impossible!“, said Andrew to dailymail.co.uk. If you enjoyed the video, please share it!